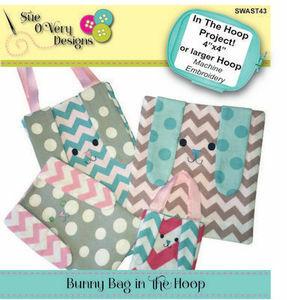 Sweet little Bunny Bags are a great quick in-the-hoop project for any season but perfect for Easter! These bunny bags have no raw edges, require three hoopings, have loose floppy bunny ears and optional handles. Finished measurements are as follows: 4x4 - 3-1/2x3-3/4in, 5x7 - 4-1/2x6 3/4in, 6x10 - 5-3/4x9-1/2in, 8x8 - 7-1/4x7-3/4in.